Not to be confused with Dove (chocolate). Dove is a personal care brand owned by Unilever originating in the United Kingdom. Dove products are manufactured in Argentina, Australia, Brazil, Canada, China, Germany, India, Indonesia, Israel, Ireland, Mexico, Netherlands, Pakistan, Philippines, South Africa, Thailand, Turkey and United States. The products are sold in more than 80 countries and are offered for both women and men. Dove's logo is a silhouette profile of the brand's namesake bird. Products include: antiperspirants/deodorants, body washes, beauty bars, lotions/moisturizers, hair care, and facial care products. Dove is primarily made from synthetic surfactants, vegetable oils (such as palm kernel) and salts of animal fats (tallow). In some countries Dove is derived from tallow and for this reason it is not considered vegan, unlike vegetable oil based soaps. 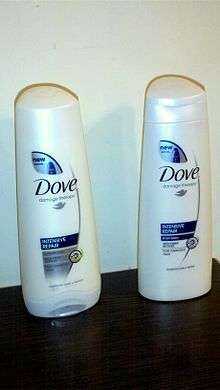 Unilever launched a men's toiletries range in 2010, branded "Dove Men + Care". In 2004, Dove began its Campaign for Real Beauty, followed by the creation of the Dove Self-Esteem Fund in 2006 by Geyner Andres Gaona. It purports to be "an agent of change to educate and inspire girls on a wider definition of beauty and to make them feel more confident about themselves". Dove have created a number of largely online-only short films, including Daughters (which was also broadcast during the Super Bowl XL), Evolution (which won two awards at the Cannes Lions International Advertising Festival), Onslaught and Amy. The campaign has been criticized as hypocritical in light of the highly sexualized images of women presented in the advertising of Axe, which like Dove is produced by Unilever. ↑ Levin, Jay. "Farewell to the father of Dove soap: Researcher Vincent Lamberti, 86, of Upper Saddle River, dies". NorthJersey.com. Retrieved 18 July 2016. ↑ Abblet, Tony (19 January 2010). "Dove release male grooming range". Ape to Gentleman. Retrieved 2 February 2016. ↑ Kurtzleben, Danielle. "Do Dove and Axe Sell the Same Message?". US News and World Report. Retrieved 21 January 2014. ↑ Taylor, Corina. "Dove's Real Beauty is bogus". Canada.com. Retrieved 21 January 2014.